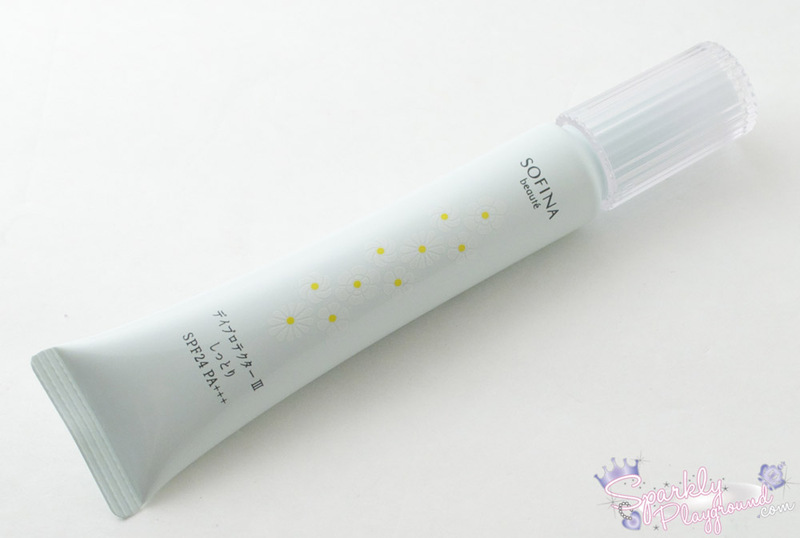 This is the version of Sofina Beaute Sunscreen that was launched in 2010. With advanced formulation, ADVAN, Barrier Ceramide and Rosemary Extract, this product protects your skin and keeps your skin young and well hydrated. Shake well before use. Use it after and cleansing. Can be used under makeup. Apply the product all over the face. On Sale now BeautyKat.com for $33.80 USD! I did a lot of research to be honest, to learn about the brand and their system/product lines. Sofina moisturizers go by codes: I for oily skin, II for combination/normal, III for dry skin, IV for very dry skin and IV is not available in every product line. The owner of BeautyKat.com kindly chose III for me to suit my skin condition (so sweet)! This product is marketed as a moisturizer/ sunscreen two in one, so let's just say it's a moisturizer with SPF. This version (SPF24 PA+++) is meant for winter/spring, where UV are assumed to be a bit less since we might stay indoors more, it's supposed to be more moisturizing and creamy. 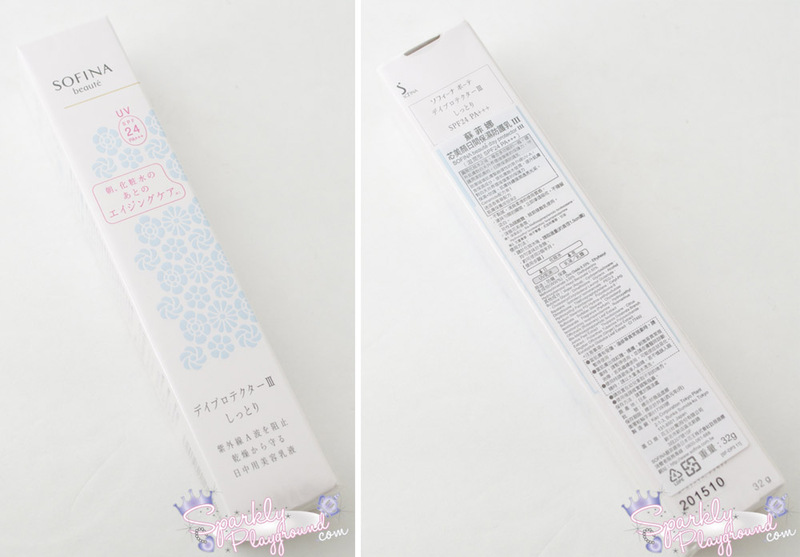 Starting with the packaging, it comes with a paper box decorated with baby blue flowers and Japanese all over! It did have a sticker in Chinese and English since I believe the product was sourced from Taiwan. I actually quite appreciate that because as much as I do a lot of research on websites, it's nice to know the usage and ingredients in my own language. 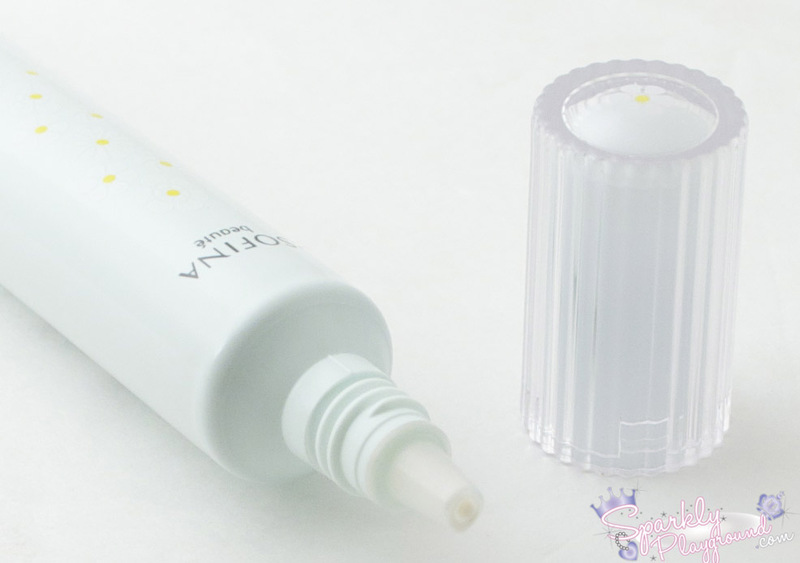 It comes in a tube so it's hygienic, provides more control and the cap is soo pretty! The cap actually reminds me of the old packaging of Jill Stuart and Guerlain. I really enjoy this packaging because I don't have to worry about leakage like I did with the Shiseido one (stupid lid)! 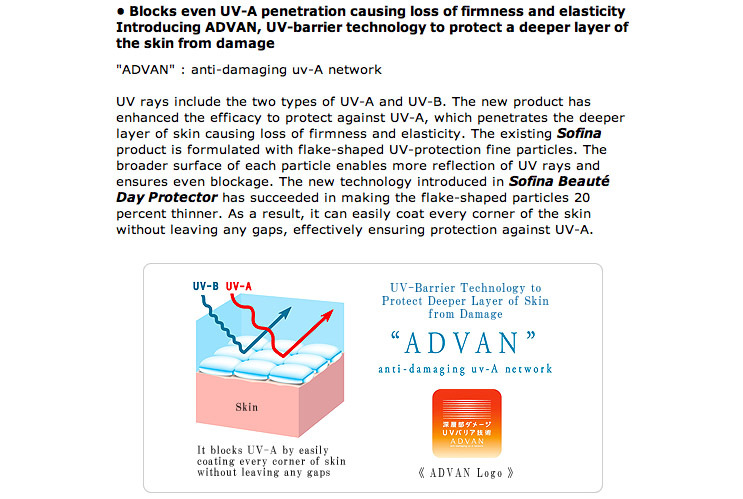 The texture is like a milk lotion similar to the Shiseido Ultra Protection Sunscreen. It spreads easily and it leaves a velvety feeling perfect to begin your make up routine (no film coming out when I applied my foundation or BB creams). The consistency is thicker than the Shiseido one though so it's not as runny and I have a better control of it. It feels nice and soft on my skin and it doesn’t give me a strong white cast like most sunscreens. I would say a very mild white cast, but because it's very easy to spread, it also sinks into my skin right away so it's not a problem at all. It doesn't give off any shine at the beginning or during the day, yet it doesn’t matte out my face making it dull either. 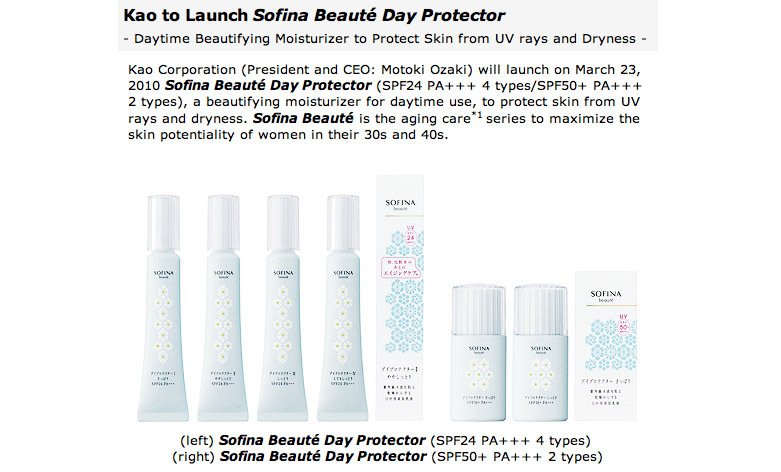 By the way, Katherine of BeautyKat.com informed me that Sofina Beaute and Sofina Beaute Whitening Series will be re-launched in the end of March but for Sofina Beaute Sunscreen, we're waiting on more information. With that said, I'm more than excited and will be anticipating for it! I think I'm pretty satisfied with this product so I'm looking forward to try more. 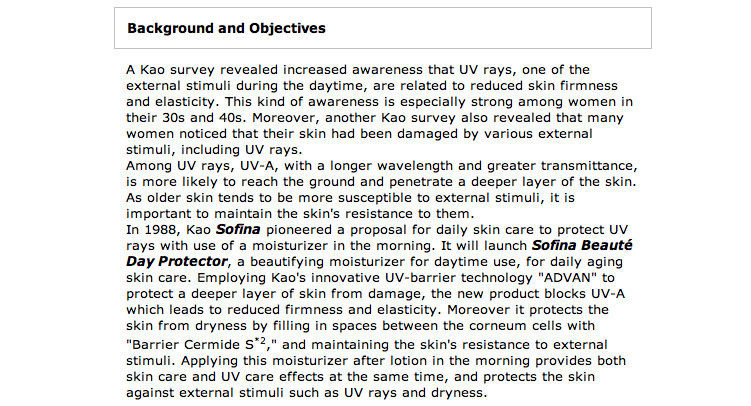 During our many email conversations, Kat inquired about my skin type and conditions before recommending me to products. Like this one, she recommended me a sun protection item because she recognizes that I care about anti-aging, sun damage and I have dry skin. This is an added bonus, because I honestly did not know she planned this until I got my product and was researching about it. So so sweet of her. The 2nd package took a little longer around 10 business days but it was because it came directly from the supplier/manufacturer, this, I'll keep as a mystery. I'm still testing them out but review should be next week or so. Price: 5/5 ♥ Cheaper than Chanel and VERY comparable.